Welcome to the We’re All Ears blog hop! Once a month, Erin Prais-Hintz posts a picture on the Earrings Everyday blog to inspire our earring designs and then on the third Friday of the month everyone shares what they have created. This month’s inspiration is a beautifully staged photo from the Pottery Barn. As usual, the first thing that I loved about this photo was the rich colors: olive-green, brown, and yellow. Swoon! After I recovered from my color swoon, I noticed the bird on the plate and how that shape is echoed in the bowl that holds the olive oil. The ceramic connectors are the creation of Marti Conrad of Marti’s Buttons-n-Beads. I love glaze on Marti’s connectors. It’s not just a solid green, there are flecks of blue and brown too. It makes them much more interesting than just a flat green color. The birds used to have 2 loops each, but my wire cutters and a file solved that problem! 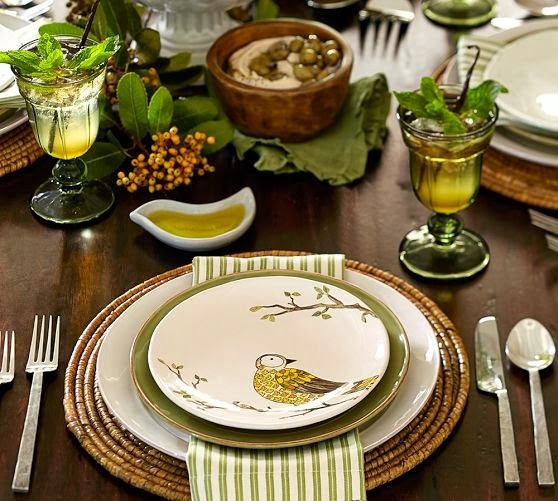 The flowers pick up the silver tones of the silverware in the Pottery Barn picture. I’ve never seen a silvery coating on beads quite like what these flowers have and I always gravitate toward unique finds! The slightly whimsical striped yellow beads bring in the yellow tones on the bird and in the base of the drinks. The Take Flight earrings are available in my Etsy shop now. 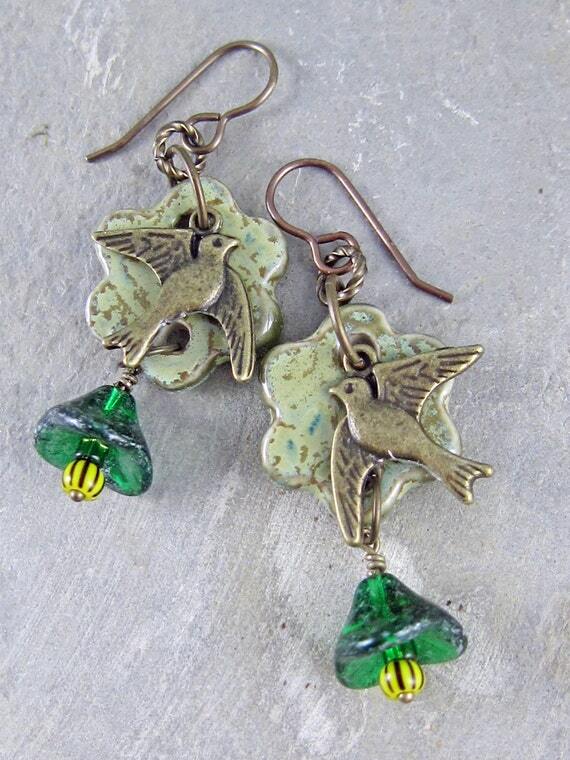 This entry was posted in Bead And Jewelry Challenges and tagged Art Beads, bird earrings, blog hop, ceramic, earrings, Earrings Everyday, flower earrings, handmade earrings, handmade jewelry, Linda Landig Jewelry, Marti Conrad by Linda Landig. Bookmark the permalink. I love how you sent the birds into Marti’s clouds! Sweet earrings!I love the birds and clouds. These are perfect for spring. Oh how perfect!! 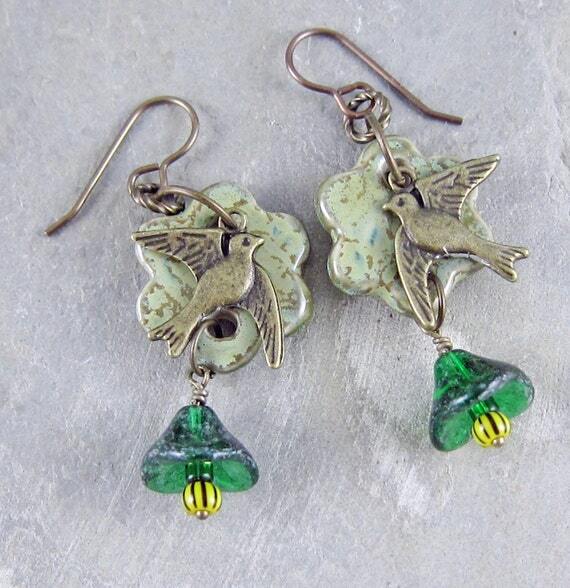 I think the little birdies really add to the earrings and go just wonderfully with the challenge photo!! Great earrings Linda! Love, love, love the birds and the flowers at the end. Whimsical! These are such perfect earrings! You captured so many elements of the photo. The ceramic connector colors are gorgeous and give such a nice backdrop for the birds. The flower and the striped beads add perfect balance to the birdy connectors. Notice how many times I have used the word “perfect” in this comment? (And I notice that I am not the only one.) I l-o-v-e these earrings!!! 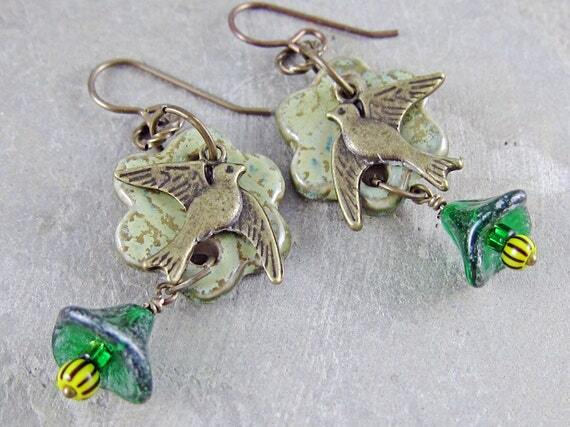 Very cute – I love those little bird charms! I love the birds, but I also love how deep the colors are in the flower beads! Your earrings are just beautiful! Cute earrings. Love the layering. I second the comment above , how brave of you to cut off one of the connectors. Love the mottled colour to the birds and clouds.